I’d planned on posting this around the anniversary of the occasion, but that would coincide both with end of the season news and a vacation I have planned starting the day after UT’s last match. So with the team in the middle of a ten day break between games, this seems like a good time to finally post this piece I’ve been working on for months — an interesting story about a big event in Tennessee history that is today all but forgotten. Tennessee has been an NCAA Tournament host every decade of its existence. Their first time was in 1982, just the second year the tournament was held. They again played host in 1984, 1993, 2004, 2005, 2006, 2009, and 2011. While it’s definitely an honor and an impressive achievement, UT has only ever hosted the first rounds, never the more prominent regional or national championship rounds. 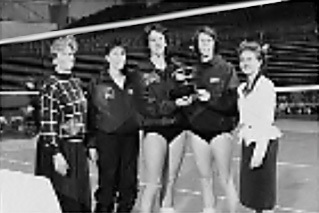 However, twenty-five years ago Knoxville did play host to a national post-season tournament, with more teams on hand than in any tournament held in recent years: the 1990 Women’s Invitation Volleyball Championship. Mostly forgotten except in media guide footnotes, the WIVC (later renamed the National Invitational Volleyball Championship or NIVC) began in 1989, and according to the NCAA “was created to provide an additional postseason opportunity for NCAA Division I women’s volleyball programs”. Often called the equivalent of the NIT in basketball, the tournament was in its second year (of what would end up being a seven year run) when it came to Knoxville. “Former coach Geri Polvino of Eastern Kentucky, the late Charlie Daniel, coach of Western Kentucky, and myself sat on the back of a bus at the AVCA Convention and decided we were going to start the NIVC no matter what. We met that January at Western Kentucky and started the ball rolling. Once we got the AVCA on board with us along with some other key people, the NIVC was made possible… Our goal was to give more postseason opportunities to NCAA institutions, and it did just that… We felt we gave teams new life and hope for their programs, and then we saw the NCAA expand their postseason field. It was a great accomplishment for women’s intercollegiate volleyball”. The WIVC invited 20 teams to Stokely Athletics Center — the best 19 remaining after the NCAA tournament filled their 32 team bracket, and the Lady Vols as the host school. 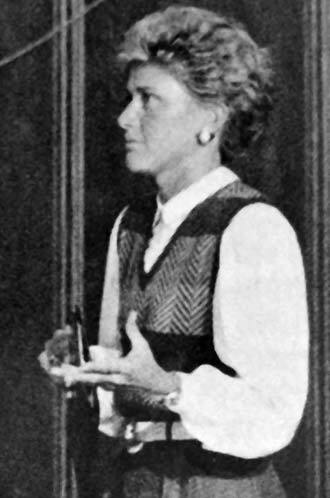 UT’s coach at the time, Sandy Lynn, told the Knoxville News Sentinel that one of the reasons she wanted the school to host was to start expanding the Lady Vol brand: “A lot of people around the country look at Tennessee as a basketball school. We need to build a volleyball reputation… I think this is a real first step”. The rest of the athletic department agreed… eventually! UT’s associate athletic director Dru Ann Hancock said, “She made her proposal in the middle of [women’s basketball] Final Four preparations [to be held in Knoxville in the spring of 1990], when the last thing any of us wanted to think about was another national tournament. But she approached the whole staff and everyone agreed it was time to do something for some of the other sports”. Women’s athletic director Joan Cronan added, “When we first talked about hosting the WIVC, we thought about what a great opportunity it would be for volleyball and the area”. Besides the intangible benefits of hosting a national volleyball tournament, coach Lynn also hoped it would eventually have a direct impact on the team itself. Potential recruits would be on hand and hopefully see the UT program at its best. Coaches from around the country would be in town for clinics, and Lynn hoped they would “go home and spread the volleyball word about Tennessee”. The #1 seed was Houston, with an 18-15 record and a third place finish in the Southwest Conference. They shared a pool with Tennessee, Eastern Michigan, Hofstra, and Colorado. The #2 seed was Cal State Northridge, with a 24-8 record in their first year in Division I. Their pool included UAB, Colorado State, Eastern Kentucky, and Iowa. Georgia was the #3 seed. They had an overall record of 26-11, and made it to the SEC Tournament finals. Boise State, Arkansas State, Akron, and Northern Iowa were in their pool. The final seed went to Memphis State, with a 27-7 record and an undefeated 7-0 mark in the Metro conference. Their pool was composed of Loyola Marymount, William & Mary, Arizona State, and Dayton. A $5 ticket was good for the entire three-day tournament, which began on Thursday, November 29th at 9am with pool play. Each team played two matches on the first day and two matches the next day. The top team in each pool would move on to a four team tournament, while everyone else would be done for the weekend. All four top seeds advanced on to the semifinals. Houston and CSUN finished pool play undefeated, while Georgia and Memphis State both went 3-1. Cal State Northridge defeated Georgia 3-0 in the 11am match Saturday morning, taking only 65 minutes to get the 15-10, 15-6, 15-5 win. At 1pm, Houston and Memphis State took the court, with the Cougars rallying back from a first set loss to win the match in four, 12-15, 16-14, 15-13, 15-4. That set up the WIVC championship match between Houston and Cal State Northridge at 7:30 that night. The teams played each other close to start, getting to a 3-3 tie. Houston dominated the rest of the first game from there, scoring the next eight points in a row and 12 of the last 13 to win the set 15-4. Cal State Northridge started to get back on track in the second set, but fell by a score of 15-12. The third game was all CSUN, who at one point led 10-2. Houston hit .049 for the set and lost 15-6. The Cougars rallied back in the fourth and took the set 15-6, giving them the tournament title and the Founder’s Cup by a a score of 3-1. Some of the players named to the All-Tournament team included: Janet Moylan, Iowa; Barb Willis, Iowa; Kathleen Dixon, Cal State Northridge; Marianne Dixon, Cal State Northridge; Beth Welch, Cal State Northridge; Latisha Charles, Houston; Karen Bell, Houston. Tennessee finished respectably with a 2-2 record in pool play, losing to Houston and Colorado on day one before rallying to defeat Hofstra and Eastern Michigan on day two. 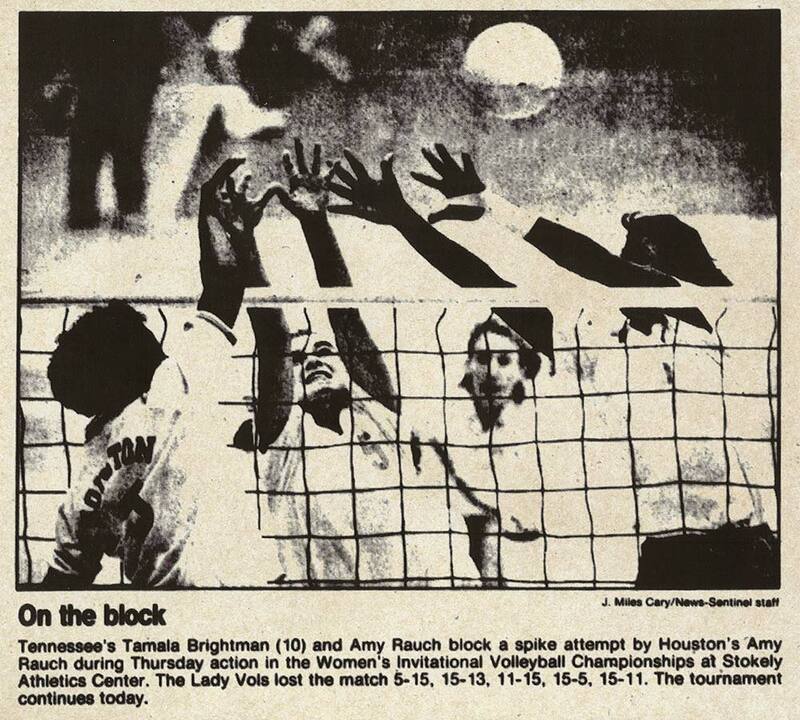 Notably, the Lady Vols were the only team undefeated eventual champion Houston faced who was able to take them all the way to five sets. UT’s Kristy Dobson had 63 attack attempts vs Eastern Michigan, a Stokely Athletics Center record which stood until 2006. She also dug up 27 balls in that game, which still stands as the 40th best effort in school history. The team had 101 digs vs EMU, a Stokely record that didn’t fall until 2007, the team’s last year in that facility.